The Arizona Wildcats look for a bounce back victory after being upset by the BYU Cougars, 23-28. Khalil Tate completed 50 percent of his passes for 197 yards, one touchdown and zero interceptions. The big surprise was that Sumlin and staff seemed to be holding Tate back from running. Hopefully that'll change sooner than later. Receivers Shawn Poindexter and Tony Ellison combined for 113 receiving yards and one touchdown while J.J. Taylor had four receptions. UofA's ground game is averaging 129 yards so far, and Taylor leads the way with 85 yards and one touchdown. Defensively, Arizona allowed 28 points and 392 yards against BYU. Missing were Jace Whitaker & Scottie Young. Both could be back and ready to go this weekend. Colin Schooler was the bright spot and led the CATS with 16 tackles, Anthony Pandy has one tackle for loss and Lorenzo Burns has three pass deflections. The Houston Cougars look for their fourth straight 2-0 start after beating the Rice Owls, 45-27. The Houston Cougars have won 10 of their last 12 home games. D'Eriq King is completing 70.8 percent of his passes for 320 yards, three touchdowns and zero interceptions. King has five combined touchdown passes in his last three games. Marquez Stevenson and Keith Corbin have combined for 200 receiving yards and one touchdown while Courtney Lark has four receptions. The Houston Cougars ground game is averaging 257 yards per contest, and Patrick Carr leads the way with 74 yards and one touchdown. Defensively, Houston is allowing 27 points and 439 yards per game. Ed Oliver leads the Houston Cougars with 13 tackles, Isaiah Chambers has three sacks and Emeke Egbule has one interception. 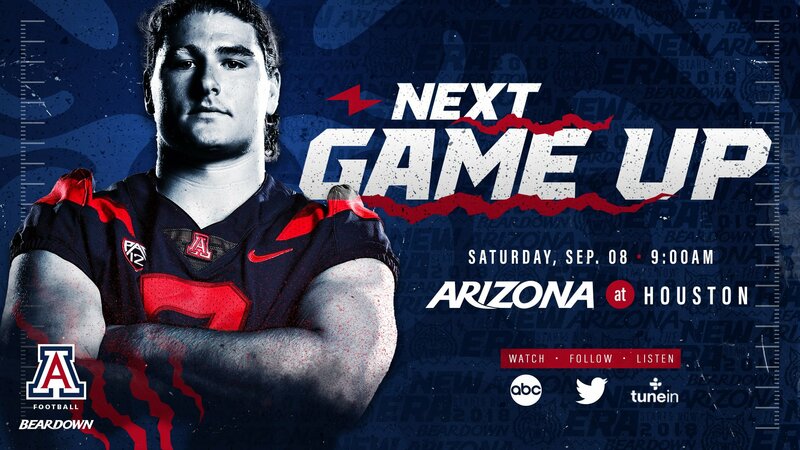 The Arizona Wildcats are capable of playing much better football than what they showed in their opener, and they finished the fourth quarter strong to at least build positive vibes heading into this week. The Houston Cougars beat Rice, but who doesn't? The Cougars are currently a 4.5 point favorite. It's only the second game of the season, but it's a Huge game for Kevin Sumlin and his Wildcats. A loss would be a nightmare & a win will get things back on track. Let's us know how you think the CATS will do against the Cougars. BearDown! Announcers for the game & check TV listings for channel in your area. Houston gave up 27 points to the same Rice team that scored 31 against Prairie View A&M. If Tate plans to have a big game on national TV...Saturday is the day. The Wildcats are now down to +3.5 point dog. Bettors are putting their money on Arizona 樂 Should be under 3 come game time. Houston now -3.5. Pretty close given our poor offensive showing in Wk-1 and that Houston's at home. Coaching staff certainly took some heat this week. Hopefully they realize how important scoring is in order for this team to win. D is more of a speed hump where an occasional stop or turnover gives us just enough to pull ahead when we're clicking offensively. Can't expect to win any low scoring games. 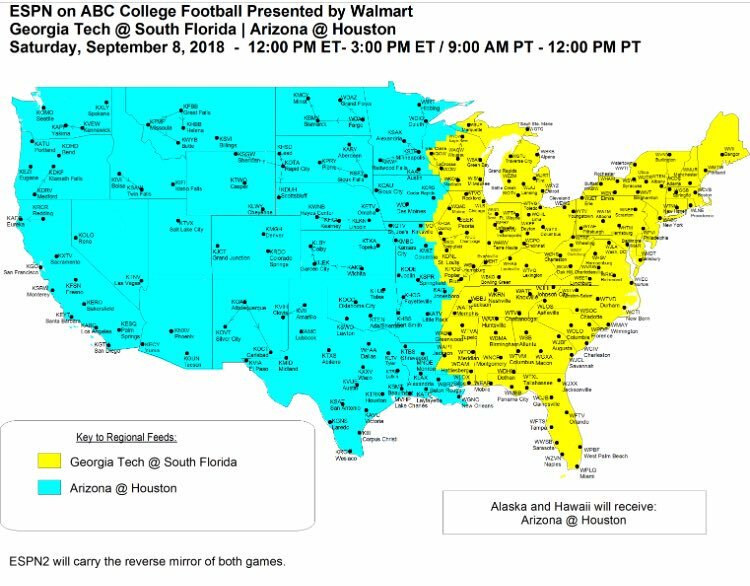 West coast gets Arizona Vs Houston on ABC. East coast gets the game on ESPN2. See map below for details. Arizona football live from Houston 45 minutes before kickoff. Currently 80 degrees 91% humidity wind 2mph. Welcome to Houston. Gotta keep Tate's jersey white. Wow, 91% humidity. That'll make everyone appreciate the Dry Heat! Let's Go!!! A pretty significant injury up front for Arizona along the defensive line. Defensive tackle PJ Johnson is in a boot and will not play for the Wildcats today.